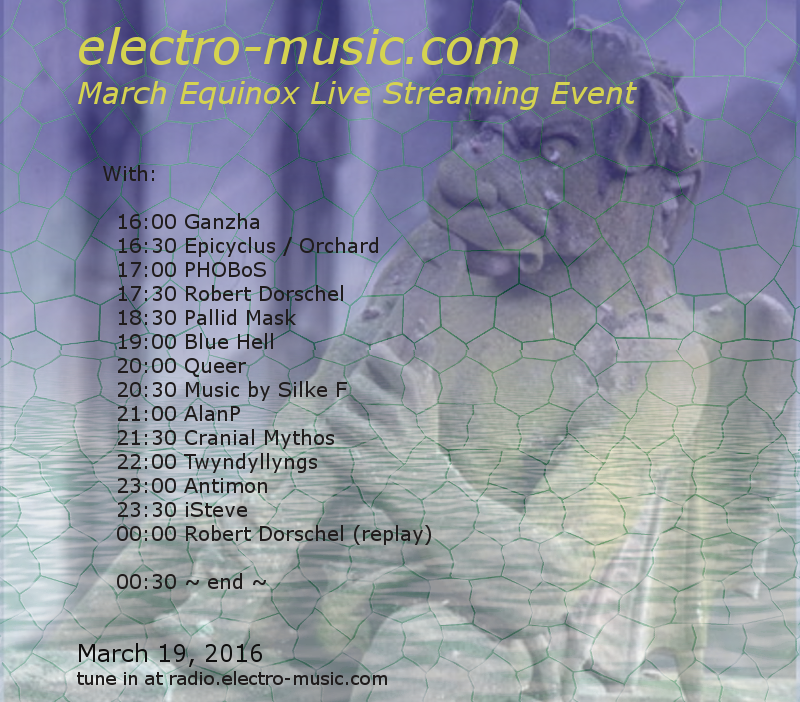 electro-music.com :: View topic - March Equinox 2016 live streaming event. March Equinox 2016 live streaming event. Posted: Sun Feb 21, 2016 7:56 pm Post subject: March Equinox 2016 live streaming event. It is almost that time of the year again when rabbits start laying eggs and chicks start falling from the trees, oh wait,..that's easter. Anyway, MARCH EQUINOX EVENT is coming up! The event will be on electro-music radio on Saturday March 19, 2016.
if we have enough people signing up, so let's see if we can make it to 24 hours! YES!!!! Sign me up!!! That will give me an incentive to finish setting up my family room/studio. I'll post info later. 1. Preferred Start Time (Please use GMT/Military Time): can I leave it a bit open? 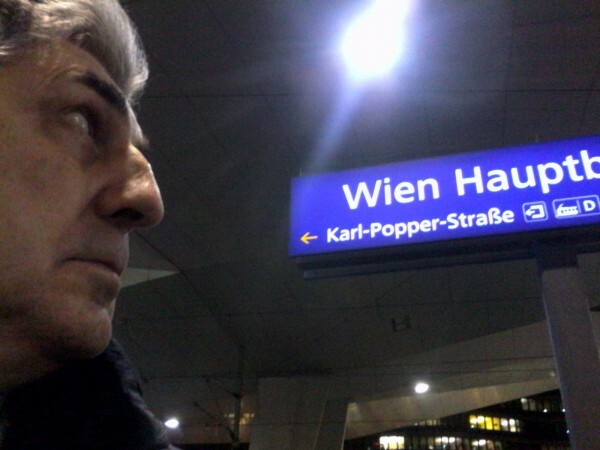 there's a possibility that a Nord Modular workshop will happen here in town on this day, and maybe I could stream from there, otherwise I'll do it at home at a later time. Stefan, I think that's a great idea. Wish I knew other electro-musician here to try to involve in a collective performance. I hope yours comes together!!! Sweet! I'm in! I'll get back here with some deets! I will be hosting this event that evening, will post a recording of the evening some time after I get time to go over it. Have fun! Posted: Mon Feb 29, 2016 11:24 pm Post subject: Re: March Equinox 2016 live streaming event. I should be good for most any time, since I'm not on sound desk or music at church that weekend. 6. ElectroAbsurd it means experiments with noise,sound paintings, atonale sequences, analogs synths only! Ok I'm good to go! 1. Preferred Start Time (Please use GMT/Military Time): I don't mind too much, not very late please. 2. Set Length (30 or 60 minutes): 30 or 60 are both fine for me. 5. Location (City/State/Country - Optional): Enschede, the Netherlands. 6. Description (Style/Genre/Equipment, etc. - Optional): probably genre-less. 8. Anything else you like to mention: I can do some switching. Since this event happens after daylight savings time, the GMT translator is off by one hour, right? Depends on what GMT translator you mean. The real time running clock, as posted in the first message here, looks at the current time .. so that could be considered to be an hour off. The schedule on the events page should show correct times, as that one looks at the date too. What? Are we going to lose an hour this coming weekend? I am not ready; it used to be in April. Uhoh. I hope it didn't happen this past weekend!!! PHOOEY!!!!! It IS this coming weekend in the US--March 13th. And I have just started getting used to it being light when I wake up. Anyhow, thanks for being on top of the time change Greg--even if it was a rude awakening. Hmmm. Maybe one of the candidates can get elected by vowing to change it back to April--after all, it was changed to accommodate big businesses, not the middle class--something about businesses saving money or something like that, I think--maybe possibly . . . . I love the musical gargoyle!!! Found out the schedule for the workshop I'm going to. It'll be earlier in the day. I'm happy to grab 30 minutes sometime after Twyndyllyngs! Would be nice to go on late for once. Ok PHOBoS pointed out in the chat that there are loads of gaps before Twyndyllyngs - I only looked quickly at Blue Hell's poster. I can take the slot just before Twyndyllyngs if that's ok! great . I added it to the schedule. well shoot, if this is really this thin of a schedule, sign me up for an hour. I'll do 30 minutes "constructed," 30 minutes noodling.